By the second half of the twentieth century, the ideal pumpkin was no longer one that would last through winter or nourish a cow but one that was "smooth and glossy orange-yellow in color with a round shape of good uniformity," as Burpee's 1975 seed catalog advertised. By 2007, 87 percent of pumpkins were not eaten but were put on display as Halloween and autumn decorations. The pumpkin's symbolism had become so much more important than its meat that many varieties, such as those sold by Burpee's, had become eye-cathcing wonders at the expense of fertility and palatability. Pumpkin foods did not even have to contain the vegetable; they could simply look like it. A rise in pumpkin sales matched the great changes in the vegetable's appearance. The U.S. pumpkin harvest of 71,700 tons in 1949 more than doubled to 195,300 tons in 1959 and then leaped to 1.1 million tons in 2007. Growers now breed pumpkins that weigh as much as 1 ton. Specimens that are more than 20% gray, however, are considered squash, not pumpkins. Grey squashes are disqualified from competitions, even though they are botanically identical to the orange pumpkins. The pumpkin simply means more. A page from the Gurney’s Seed and Nursery Company, 1998 Spring Catalog, Yankton, S.D. 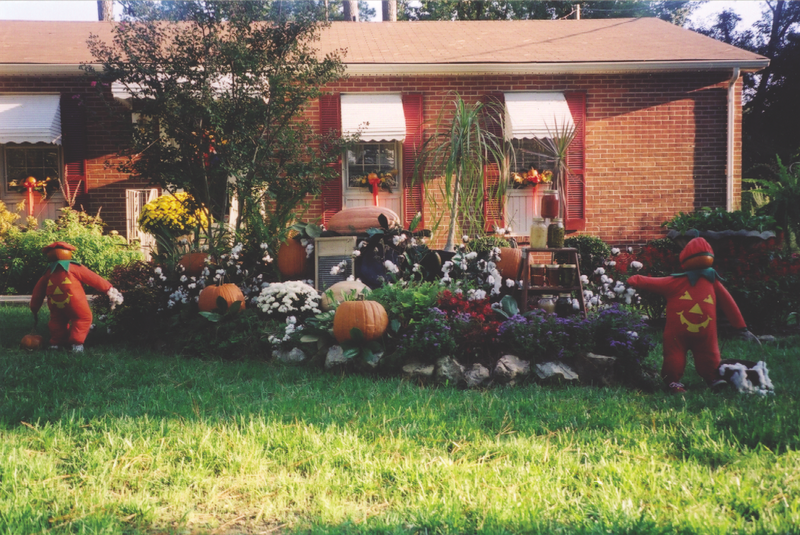 Spring Hope, N.C., October 2000. Photo: Cindy Ott. “Pumpkin Spice Cookies,” cookie cutter & spices. Bark & Barkley, Inc., 1995.